The following bulletin was obtained from the public website of a major disaster recovery partnership. (U//FOUO) This Joint Intelligence Bulletin (JIB) is intended to provide information on the recent arrest of 11 domestic extremists for conspiracy to impede officers of the United States from discharging their official duties through force, intimidation, or threats, in violation of 18 USC §372. This JIB is provided by the FBI and DHS to support their respective activities and to assist federal, state, local, tribal, and territorial government counterterrorism and law enforcement officials in deterring, preventing, or disrupting terrorist attacks against the United States. As in any criminal case, defendants are presumed innocent until proven guilty in a court of law. 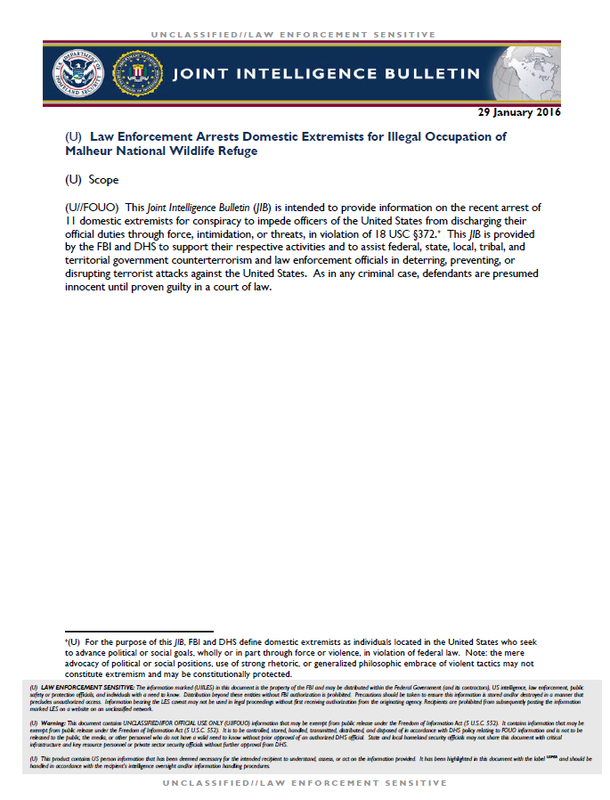 (U) On 26 January 2016, the FBI and Oregon State Police initiated a probable cause arrest of domestic extremists associated with an illegal armed occupation of the Malheur National Wildlife Refuge (MNWR) in Harney County, Oregon. » (U) The FBI and Oregon State Police initially arrested five militia and sovereign citizen extremists on 26 January during a traffic stop north of Burns. *,† The five are identified as: Ammon E. BundyUSPER, Ryan C. BundyUSPER, Brian CavalierUSPER, Shawna CoxUSPER, and Ryan W. PayneUSPER. During the arrest action, shots were fired by the Oregon State Police, resulting in the death of Robert LaVoy FinicumUSPER, according to official information. » (U) Militia extremists Joseph D. O’ShaughnessyUSPER and Peter SantilliUSPER were later arrested in Burns, and militia extremist Jon E. RitzheimerUSPER surrendered to authorities in Peoria, Arizona for their roles in the illegal occupation, according to official information. » (U//LES) Militia extremists Dylan W. AndersonUSPER, Duane EhmerUSPER, and Jason PatrickUSPER were arrested on 27 January after leaving the MNWR and surrendering to the FBI, according to law enforcement information. (U) All 11 individuals face federal felony charges of conspiracy to impede officers of the United States from discharging their official duties through force, intimidation, or threats, in violation of 18 USC §372, according to official information. (U//LES) Multiple sources with varying levels of access reported on 2 January 2016 that Ammon Bundy and Payne led a group of armed individuals—who later self-identified as the Citizens for Constitutional Freedom (CCF)USPER—to seize the MNWR, located approximately 30 miles south of Burns. Over the next 25 days, group leaders and a growing number of armed supporters made repeated demands that the US Government turn over federally owned property located in Harney County to the CCF for supposed redistribution to local residents. Group leaders simultaneously sought to expand their illegal action to other federal sites in the West. (U//LES) Following news of the arrests, some individuals peacefully departed from the MNWR, but reporting as of 28 January 2016 indicates that a small group of armed individuals continue to illegally occupy the site, despite requests to leave made by law enforcement and public officials. In response to news of the arrests, some militia extremists and their supporters have called for violence or unspecified nationwide action against law enforcement, federal facilities, and US government employees. (U//FOUO) In light of these threats and because the CCF had been urging local residents to occupy other federal facilities, the FBI and DHS urge recipients of this bulletin to use caution during encounters with suspected domestic extremists, and to be vigilant of potential surveillance or pre-operational indicators. Some of these behavioral indicators may be constitutionally protected activities and should be supported by additional facts to justify increased suspicions. (U//FOUO) No single behavioral indicator should be the sole basis for law enforcement action; rather the totality of behavioral indicators and other relevant circumstances should be evaluated when considering any law enforcement response or action. Independently, each behavioral indicator may represent legitimate recreational or commercial activities. Multiple indicators, however, could suggest a threat.